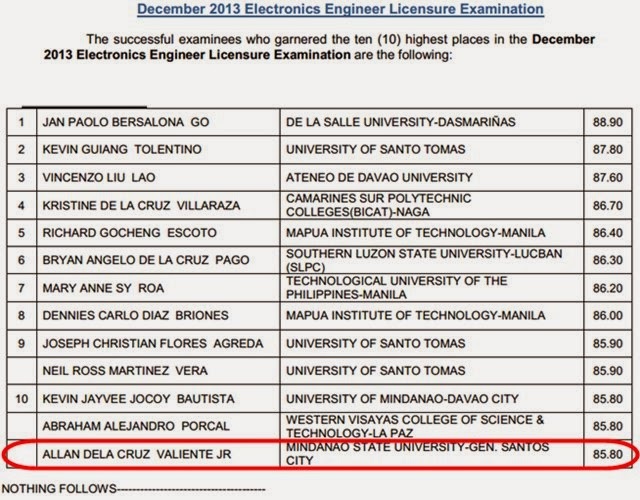 Mindanao State University - General Santos City produced another topnotcher in the recent Electronics Engineer Licensure Examination administered by the Professional Regulation Commission given last December 14 & 15, 2013. Allan Dela Cruz Valiente Jr. got 85.80% to place 10th among 1,707 passers out of 4,497 examinees. MSU-Gensan scored a 53.85% passing rate.